If you’re not into bold colors or prints, I apologize now. 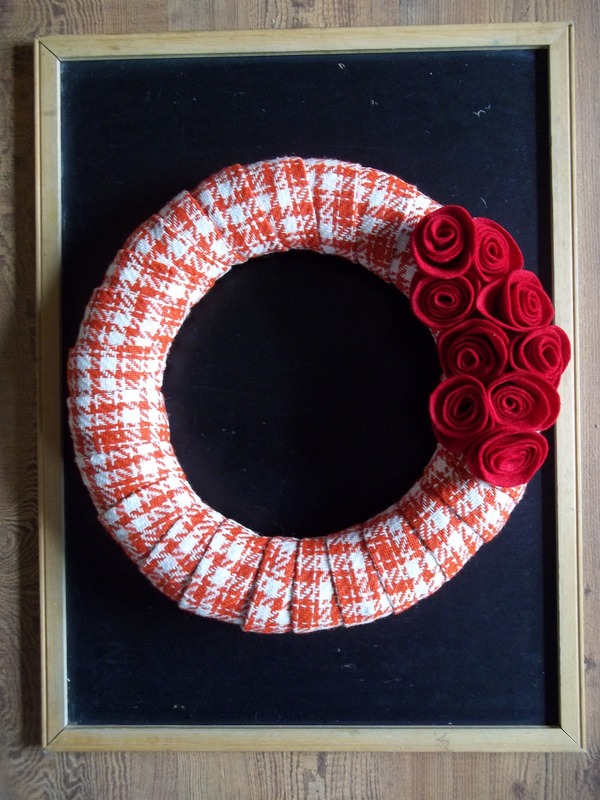 The wreath I just made is definitely not for the faint of heart. 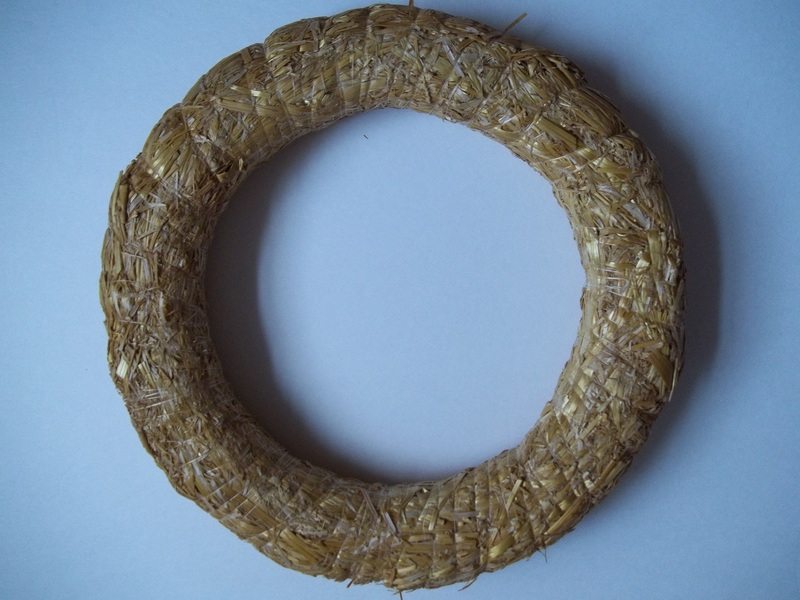 I started out with a plain straw wreath form (14″). A foam wreath form would work too. Taking some vintage fabric, I cut long lengths of it, @5-6″ wide. 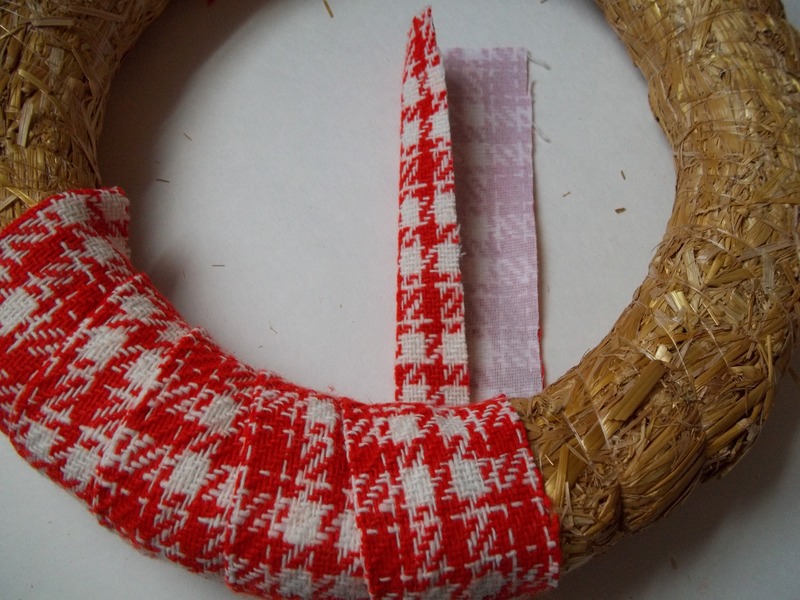 Folding one edge in as I went, I wrapped it around the wreath form until it was completely covered. I hot glued the ends to hold in place. 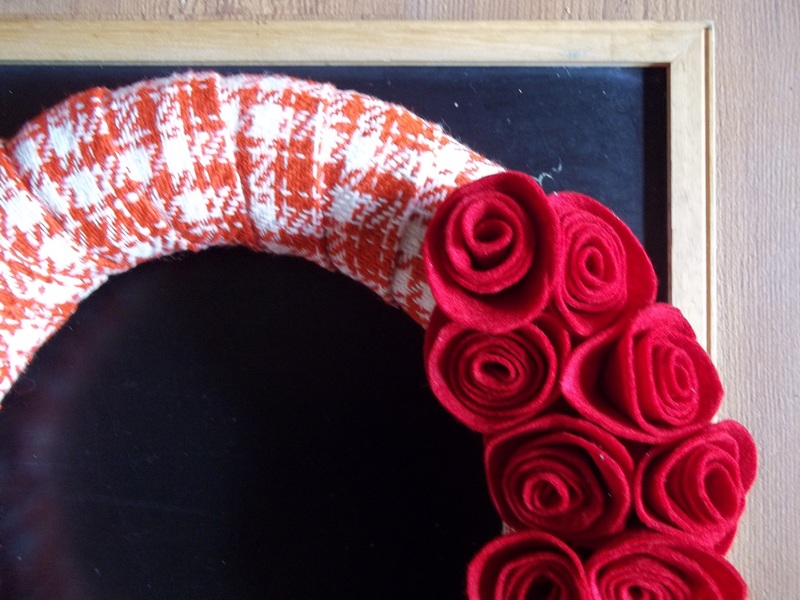 Using the same method for making felt roses I used here, I made 9 large red blooms and adhered them to one side of my wreath. That’s it! The results? Well, you’ll either like it or hate it. I’m hoping for like it, but we’ll see. One thing’s for sure though–any front door with this hanging on it would be impossible to miss! Very nice colors. Thanks for linking to Things I’ve Done Thursday. Red is one of my favorite colors–I’m wearing a red blazer now! And after a week of no power thanks to storm Alfred on 10/29, bright is what I need. Love the wreath. Pretty, pretty! 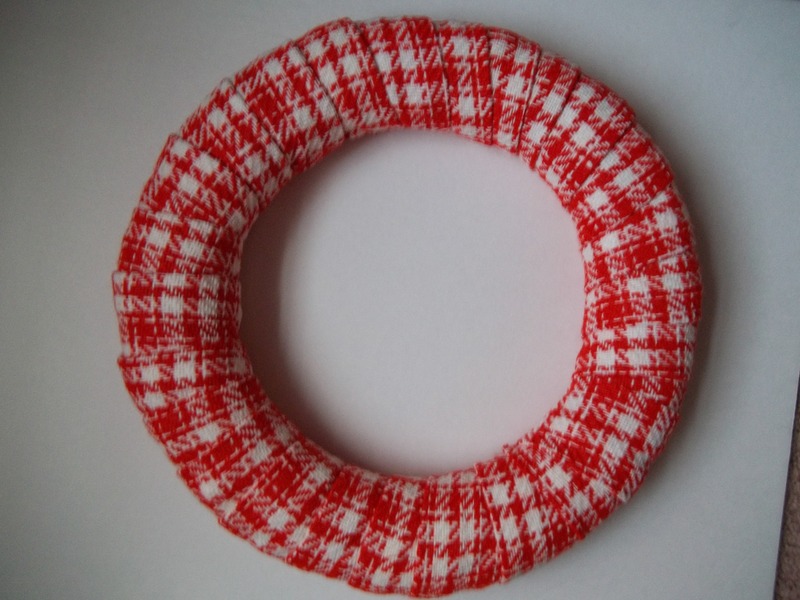 I love this, especially for a modern twist on Christmas wreaths. Pinning it! I am thinking of all the possibilities for this wreath…maybe even a pink/cream one for my little girl’s new room…it’s shabby chic style. I have wanted to try the rosettes for a while! Good for you still doing things for you amidst kiddos! I love your wreath. The fabric is awesome. Love this! Red is one of my favorite colors! This can be so Christmasy! !Thanks for sharing! This is so beautiful and the color is great I love how it pops. You did a great job…..
Wow … I love the houndstooth! Too perfect. Very Cute! I absolutely love it!!! I found you at Show and Share! I absolutely adore your wreath. Welcoming and Bright! I simply love this little wreath! 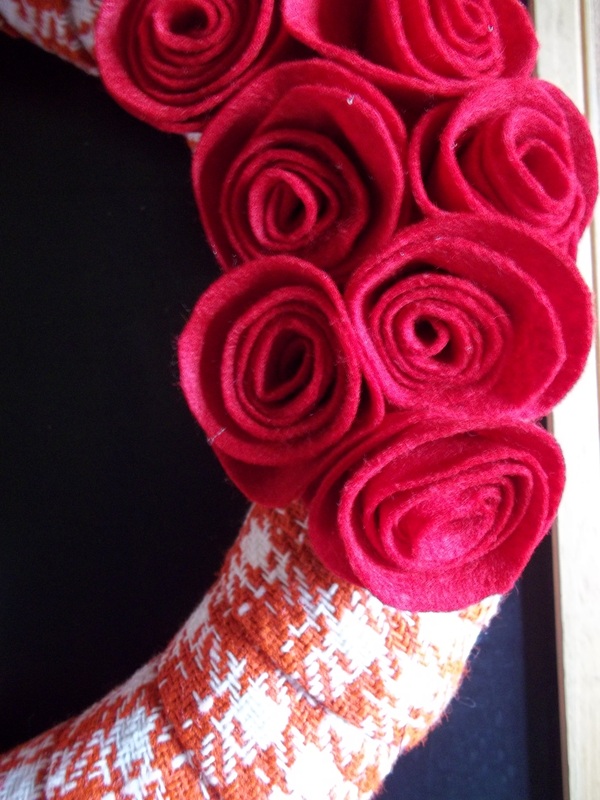 So much that I am going to feature it tomorrow from the Show & Share link party! Thanks so much for sharing that with us! super cute! 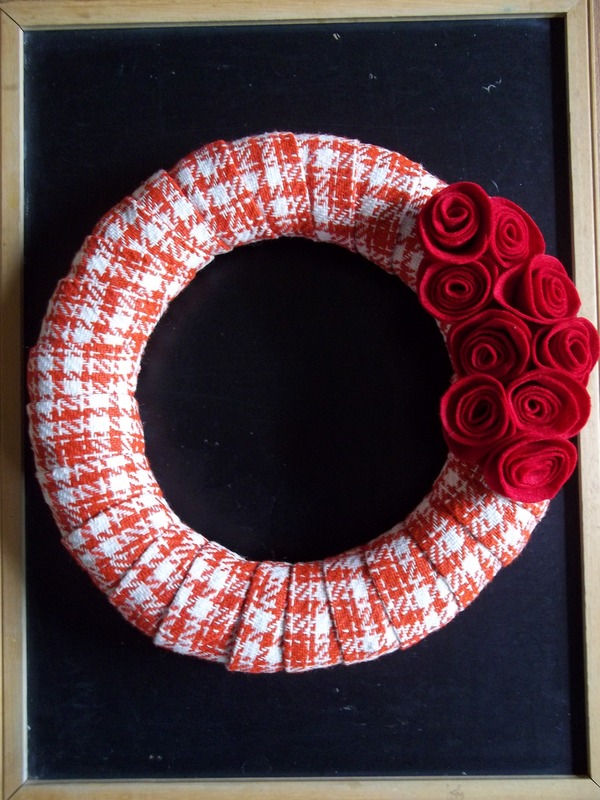 I am goingt o make this with my family as an after thanksgiving craft 🙂 How much fabric did your wreath take? I was thinking 1/2 a yard??? just too magnificent. I actually like what you’ve acquired here, certainly like what you’re saying and the way in which you say it.